Who are we really? Who are you? Who am I? I’ve already told you a little bit about myself and why I am writing as Lila. What about you? Our girls are so unique (I know…just like the rest of us.). I remember when both of them were born I said a prayer and asked God to let them be anything he wanted, but just not vanilla. Boy, has he answered that prayer! Katie Lea is a passionate young woman who expresses her thoughts freely and her artistic abilities with abandon. Caroline has a beautiful heart for service…and purses and fashion. Our culture excels at keeping us coloring in the lines or inside the proverbial box. 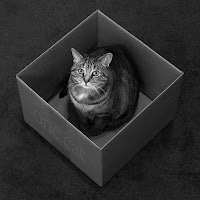 I say, “What box?” When we open our hearts to God’s possibilities, there isn’t a box. Inside the box it is dark, stuffy and light can’t penetrate. We can’t grow inside a box. It’s like those Chinese women who had their feet bound during their youth so their feet wouldn’t grow any more. That’s what living in a box does. It keeps us from being all we were meant to be. It keeps us from growing. And, we know that what isn’t growing is dying. What a tragedy it would be to die before we’re fully born. What does your box look like? Family, social, job expectations? Who are we really? Sans box? Come on. Poke a hole in the top of the box. Feel the light pouring in. Feels good, doesn’t it? Now take your other finger and widen the hole. Now, use your hands to really open it up. Let your eyes adjust for a moment . Now, step out on your cramped and tired feet. Reach up to the light giving life and begin running with abandon to the Father of Life who created you to live in his love… not a societal box. Would love to do a book review of Same Kind of Different As Me. "Lila" - Well done! I'm excited to read more from you! I, too, want out of this box! Sometimes it occurs to me that I am going to die without having lived, because I try to be who everyone wants me to be, do everything everyone wants me to do, just scared to death someone will not be pleased. And look! no one is pleased; they're not; I'm certainly not. Why put ourselves throuogh all this? Thanks Lila, for this wonderful encouragement to go ahead and break out of this dumb box.